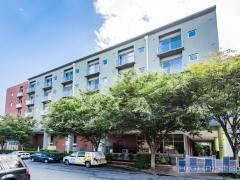 Situated in the heart of South Buckhead off of shady Biscayne Drive, the Terraces on Peachtree are perfect for buyers looking for a single-bedroom or two-bedroom unit. The building is equipped with a lush pool and pool deck perfect for relaxation, and as the name suggests, the unit terrace areas are comfortable and spacious. Have any comments or questions about The Terraces at Peachtree? Ask your question and/or share your thoughts about this Building.